Pros: for one, its larger than you'd think. very husky(thick glass, big structure, dense, heavy), like your average small bowl, but virtually magnified and put into reality. deep bowl pack, milks up, might have to take two hits just to clear it. other than a different color cordination( mine as red and yellow), its 6 out of 5. i wouldn't take it out of the house but thats me. get this bowl. 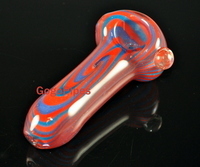 2 day shipping, 10.00 bowl. Cons: none. the screen doesnt stay in, but thats just a matter of smoking.